Long-term US bonds or ticker TLT is a spike top as I pointed out awhile ago on StockPursuit.com. A spike top is a strong bearish reversal signal. 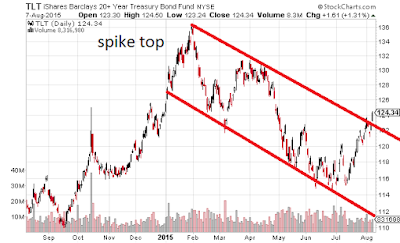 Clearly you can see the downtrend TLT has been in since the top with this chart. The red lines encompass the channel it's in. It's testing resistance here. It is actually a little above the trend line. We will have to see how it does the next few days. I'm still bearish on TLT. Hopefully it runs up some more to give a good shorting opportunity with TBT.